THIS IS NOT A NORMAL REBLOG!!!!! Go visit my new site . . .
and read . 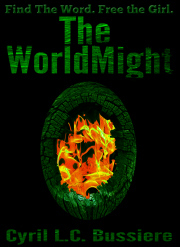 . .
New Questions for Cyril Bussiere of The WorldMight! New Format! None of my Rambling! You’ll enjoy! Go check it out on my new litworldinterviews site and makes sure to follow Cyril on his site and Twitter. “Spell binding. I didn’t want the book to end. In The WorldMight Cyril Bussiere weaves together a world of fantasy and the deep, complex questions of life. The characters are wonderfully and fully drawn.”-V.C.